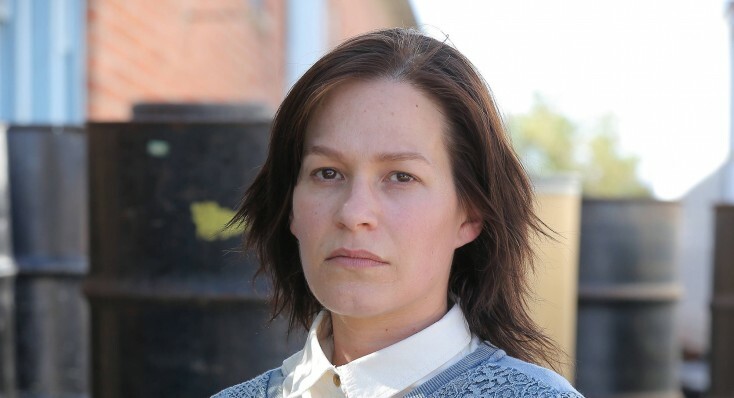 HOLLYWOOD—Franka Potente has upped the ante this season in the FX crime drama “The Bridge. She plays a shunned Mennonite named Eleanor Nacht, who has many secrets, including the fact that she is involved with upper echelons of the Mexican drug cartel. The series, which stars fellow German Diane Kruger and Mexican actor Demian Bichir, airs Wednesday at 10 p.m. ET/PT. The 40-year-old actress is no stranger to playing complicated characters. She played a thief who gets in over her head in her breakthrough role in Tom Tykwer’s“Run, Lola, Run,” and, more recently, she played a madam in BBC America’s “Copper.” Movie audiences will remember her as Matt Damon’s love interest in the “Bourne” spy films. The dark-eyed beauty is married to American actor Derek Richardson, with whom she has a 3-year-old daughter named Polly. Being a real-life mom has given her new perspective and has also come in handy when she interacts with child actors. She is in all but one episode this season. “Eleanor goes on vacation,” she quips. She spoke by phone about this complicated character with a distinctive and disturbing dark side. Q: Your character has this very plain, unobtrusive exterior, but inside it seems to lurk a heart of a sociopath or a psychopath. How has it been getting into that character, and what attracted you to her? Potente: I was given very little information when I embarked on this journey. I knew the show so that was a door opener, but (show producer) Elwood Reid told me she’s bad. She’s very dark. She has dark secrets that only reveal themselves episode by episode. She’s a shunned Mennonite. I did some research and then put that in the back of my head to see if it ever surfaces again by itself. A lot of things you can’t play. Her simple, plain look is mainly created by the costume designers. I’m there to maybe give my opinion or something, but I appreciate their knowledge very much so I just basically put on what they give me. Eleanor doesn’t care about what she wears. Inside, she’s also quite simple to be honest with you. What’s complicated is her baggage from the past and the history of the terrible things that have happened to her and are still very present in her life that are driving her to do what she does. She’s a very structured person. Basically, either things go as clear as Eleanor needs them to be or people need to be removed because they endanger the structure. In a strange, beautiful, weird way, that is actually very simple for her. Q: As an actress, how is it for you to be able to take a character and be able to do it over this longer period of time than you normally would do, say playing a character in a film or doing a guest-starring role on TV? Potente: It’s amazing. I loved every little bit of it. At first, it wasn’t quite clear that Eleanor would stick around this long. We had maybe seven episodes in mind, and then it just kept growing and she kept sticking around. I like this kind of work where every week a stone is turned over, and it’s almost like I’m given a new challenge or something; a scavenger hunt that will eventually lead me to the goal or the prize. It’s a very playful approach. In movies versus TV work, we get a script maybe two, three months ideally before we do the movie and then we have to know everything (about the character). We have all the conversations and we have all the rehearsals and then we start shooting. It’sa very different dynamic from a lot of the stuff that we do in TV. The way we work, the pace and everything is a lot more realistic as to how we would discover a person in real life. You meet someone, let’s say, you start dating and then every week you find out more things. You don’t know everything about a person the minute you meet them, but if I play a character in a movie, I have to know everything about that person the minute I start shooting day one. I really do appreciate this way of working because it keeps everything fresh. It keeps you on your toes. It keeps you curious and sometimes you’re surprised. I think that happens with us. That happens with friends, so I can connect to that very much. Q: A lot of people have said that you are the most intriguing character in the show this season. How do you felt about that? Potente: Thank you very much. I guess that’s not a bad thing. It’s easy, though, when you’re the new kid on the block. She’s definitely weird so I think her character raises a lot of questions, and that is intriguing. I’m also aware and very grateful for my environment. It’s easy to join an environment like the one on “The Bridge,” where the stakes are already high. All the characters are ambivalent and interesting so we’re already in an environment that feeds everyone. Eleanor definitely thrives and lives off of that. We just wrapped yesterday so the job’s done for now. I definitely benefited from all that, and it made it so much more enjoyable. I loved going to work every day. Q: As a mom in real life, how difficult it is for you to have those intense scenes with the child actors. Between takes, do you relax a little? Potente: Well, yes. Danny (Max Page), the little guy, he is maybe five or six or so. Being a mom, I know how to speak to kids better now than I did before I was a mom. Sometimes on a long day of shooting, where I leave early in the morning and I come home late, I don’t see the kids so I kind of miss them. I guess that probably goes a little bit into me interacting with the kids there on set. They’re awesome and very professional and sometimes shocking how well behaved and patient they are. Otherwise, Kyle (played by Daniel Polo) and Max are just colleagues. Q: It’s very rare that we see a strong, single-minded woman playing a role like this. Can you just chat a little bit about playing the role that is usually reserved for men to play? Potente: I don’t look at it that way. I don’t have any awareness of it while I work on it. To me, it is what it is. That’s how it is for Eleanor. To be honest with you, it might seem more extreme because it’s enhanced. It’s like this weird-looking, frumpy-ish, but yet hard-*** woman in the Mexican cartel world. If we translate the question into our real lives, women have to be superheroes. We have to be moms and we have to lose the baby weight in eight weeks. We have to be back at our desk another week later. We have to be awesome and beautiful and wear heels and work out. That’s really tough as nails. Despite Eleanor’s appearance in this, I think that makes it maybe a little bit more odd. In reality, woman are not softer than men. I think in the world we live in right now we have to do everything with the same energy and the same vitality and be strong. We’re go-getters just as much. Q: It’s interesting that Eleanor is almost like a counterpoint to Sonya (Diane Kruger’s law enforcement character). On both sides you have some very cold, very task-driven women. Can you talk about maybe the parallel and the contrast between those two characters? Potente: I totally agree. They have a lot of similarities. They’re both struggling with something family-related in the past that they want to end, or want to come to terms with. They are both driven by some weird passion even though on the surface they are aloof or cold or whatever. They’re definitely on different sides of the river. Sonya is the law and Eleanor is definitely not. She operates by her own laws. It’s going to be very interesting to see, as the show proceeds, if these women do get to interact or, if their paths cross, one can imagine that it’s going to be very interesting. Q: Has there been any incorporation of current events on the US/Mexico border into the episodes? Were the scripts tweaked to reflect what’s going on? Does the subject come up among the cast and crew? Potente: It’s very present because we work with Mexican colleagues who have families in Mexico. It is something that’s very present among us. I can’t tell you exactly what was adjusted. I do think (the writers) try to be as current as possible with events that happen right now politically but the scripts are written far ahead. They’re trying to keep the presence of danger, of corruption. They try to keep a level that is kind of realistic. I don’t know how much they can make it a priority to adjust things on a whim.